Earlier this week I grabbed the new Plasma source tarballs and used them to update my ‘ktown’ package set for KDE 5. I tagged that update “5_15.02_02” to indicate that this is my second release in Feb 2015. Plasma has been upgraded to 5.2.1, this is a bugfix release. No new functionality or packages. The deps/libssh package has been re-added. I used it for my KDE 4.14.x packages because the newer version (compared to Slackware’s version of the package) allows the sftp kioslave to be compiled in kde-runtime. The kde/applications/kde-runtime package has been recompiled against the newer libssh package. And kde/frameworks/kglobalaccel was also rebuilt. The kglobalaccel5 deamon moved from plasma-workspace-5.2.0 into kglabalaccel-5.7.0, but when I built kglobalaccel with plasma-workspace-5.2.0 present it picked up a dependency on that package’s libkdeinit5_kglobalaccel5.so library. When I upgraded to Plasma 5.2.1, that library was suddenly gone and kglobalaccel5 would no longer start. Upgrading from Slackware’s KDE 4 to this KDE 5 is non-trivial. You will have to remove old KDE packages manually. If you do not have KDE installed at all, you will have to install some of Slackware’s own KDE 4 packages manually. If you are upgrading from KDE 5_15.02 then it’s an easy and painless upgrade, in particular when using slackpkg+. If you are completely new to KDE 5 for Slackware, I urge you to also read my previous posts about KDE 5_15.01 and KDE 5_15.02 in its entirety, as well as the follow-up article about the changes in system tray support in the Plasma 5 desktop which is mandatory reading material as well if you are using Dropbox, Skype and other non-Plasma 5 software that wants to dock an icon in the system tray. 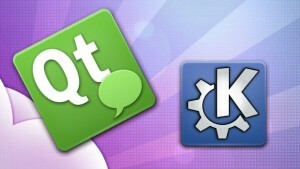 Someone mentioned in a comment to an earlier blog post that LxQt 0.9 uses some of the KDE Frameworks, now that they have migrated from Qt 4 to Qt 5. To accommodate Slackware users who want to run that version LxQt I have added repository definition files to the frameworks package directories, so that you can use the Frameworks package repository even if you do not want to install KDE 5. Posted: 27 February, 2015 in Slackware, Software. I noticed that for some packages you move the dbus *.conf files from the /etc/kde/dbus-1 directory to the /etc/dbus-1 directory. There some *.conf files left over in /etc/kde/dbus-1 (org.kde.kcontrol.kcmsddm.conf org.kde.ksysguard.processlisthelper.conf org.kde.polkitkde1.helper.conf). Shouldn’t those files be moved to /etc/dbus-1 as well? Note that I have moved them manually and because of the *-polkit-*.conf file I hoped it would solve the missing suspend/hibernate menu entries. Unfortunately nothing changed. manciuleas, yes those should be moved, I did not see them in time. Next update will have that fixed. Seems to get better every time! Although I am getting the same “features” as before. I was just curious if you had any news regarding the KDE bug you reported. The suspend/resume/shutdown issue that we have seems to be deeper that just related to building/packaging. Previous versions of KDE did not have a touchpad kcm module either. What is UFW? Not something that has ever been part of Slackware. I will not fix anything related to amarok, the player is an abomination. You probably have to install a gstreamer plugin for mp3 playback in amarok, try gst-plugins-ffmpeg from my repository. There are several alternatives that can playback mp3 and that are better than amarok. great work as always. As ‘stable’ is well over a year old now and has the same KDE as ‘current’, I wonder what KDE version will make it into current? Do you have any clue? Will there be an update to Kde 4.14.3 ? It feels rock solid. My guess is that KDE 4.14 will eventually end up in Slackware-current. Several of the KDE 4.14 source tarballs have KDE 4.14-compatible updates available as part of Applications 14.12.x (kdelibs, kde-workspace, kdepim*) and those could be added even though there will not be an explicit KDE 4.14.4 release. Thanks for your hard work on this but KDE 5 seems very unstable on my system. I am getting lots of tearing and crashes. What is the safest way to remove it cleanly so that I can return to KDE 4.14 ? Many thanks. Hi esteeven, it depends. Are you using slackpkg+ or are you maintaining your 3rd party packages manually? slackpkg+ did the job without problems. Many thanks for the pointer. I installed KDE5 from SlackBulds yesterday and it run quite stable since. There are some bits missing but no crashes or so. The only important Program broken was Libreoffice (4.4.1.2) with “libvcllo.so: undefined symbol” . After I replaced harfbuzz-0.9.37-x86_64-1alien with v0.9.16 from -current , it works again . Someone experienced the same prob ? What is is harfbuzz 0.9.37 supposed to change compared to 0.9.16 ? Hi alienbob. I just upgraded my slack14.2 kde to plasma following your readme file. Excelent job. By the way, I hada minor issue. After upgrading, I could not startX unless I was root user. Digging aroudn, some people said it was about root permission and thins like that. What It was, for me at least, was that there was no .xinitrc file on my non-root user. Just copied root .xinitrc to home/$USER/ and now i run Kde Plasma smoothly! Thankyou! Francisco, in Slackware the default X desktop is KDE 4. But if you remove KDE 4 and replace it with Plasma 5, the default xinitrc file for “startx” has been removed. In runlevel 3 (console boot) you will have to run “xwmconfig” to configure a new default Window Manager (or Desktop Environment). If you run “xwmconfig” as root, it will set a default DE for all users in /etc/X11/xinit ; if you run the command as your regular user, it will create or update a file ~/.xinitrc .